The MG SA was launched at the 1935 Motor Show and this elegant saloon was the first all new model to be introduced since the merger with Morris Motors in July 1935. It was launched alongside another new model, the PB Midget and a revised version of the N type Magnette, but everyone's attention was turned to the SA. 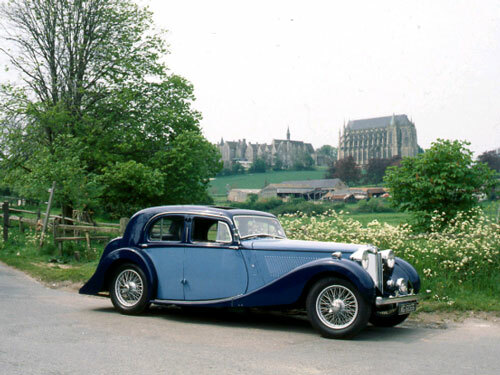 This brand new car was a shock to the MG fraternity as it was a car of such huge proportions compared to the previous Abingdon offerings and was to be the largest MG to date. Many enthusiasts refused to recognise the SA as a genuine MG choosing to forget the fact that some of the earlier Magnettes were not exactly small cars. To understand the reasoning behind the launch of this luxury sports saloon, we need to look back to early 1935 and the revolution that swept through Abingdon. Leonard Lord was appointed as the new managing director of the MG Car Company when Nuffield sold the concern to Morris Motors in July 1935. Virtually overnight all racing activities and developments were ceased and although Cecil Kimber remained at Abingdon, there was little that he could do without the consent of Lord. Initially Lord said that he did not want to produce any more MG sports cars as they interfered with his plans to streamline the organisation. However Cecil Kimber still retained a lot of influence and he managed to gain enough support to eventually change Lord's mind. The end result of this disagreement between Kimber and Lord was the production of the MG Two Litre SA Saloon first announced in October 1935. Lord felt that all that was necessary to sell a Wolseley at an inflated price was to put an MG radiator on it. This thought was rapidly dispelled by Kimber and his supporters and Kimber was allowed to design a new body for the Wolseley chassis. This he did with great success, producing a very attractive well proportioned body and at a mere £375 for the saloon version it was attractively priced as well. It was exceptional value for money particularly when compared to its predecessor the KN Magnette at £399. Other coachwork which included a four seat tourer and the handsome Tickford Coupe followed later. The pleasing appearance of the coachbuilt body was subsequently adopted by some of England's leading coachbuilders; one of note was Mulliner Park Ward. In terms of luxury, internal appointments and overall appeal, the SA stood favourable comparison with many other similar cars of the era. Sadly the car suffered from the inefficiencies that Leonard Lord was trying to get rid of, with the SA going through numerous changes of components, in order to take advantage of the standard items utilised by Wolseley. The production of the car was inevitably delayed through too many people being involved in the decisions surrounding the use of components, production procedures and the general inflexibility of the Nuffield group as a whole. The SA model was aimed at the larger luxury car market. Based on the Wolseley Super Six, this graceful sports saloon was intended to be a prestige model that would enhance the Company image and move away from the stark and somewhat basic sports cars that had made MG famous. Certainly insurance companies welcomed this departure as there was considerable disapproval previously over the sporting image and hefty premiums were often imposed. This fact was no doubt considered by the Nuffield organisation as they invested heavily in this new luxury sports saloon. The MG purists were however most displeased with the SA as the familiar MG chassis was dispensed with, being substituted with a heavy conventional box-section Wolseley based variety. Gone also was the overhead camshaft engine, which was replaced with a Wolseley Super Six 2 litre pushrod operated unit. The familiar cable operated brakes were replaced with Lockheed hydraulic type, a system that Kimber did not favour at all, maintaining that the old style cable brakes were far more dependable. The prototype had pressed steel bolt-on type wheels instead of the knock-on wires and as a final insult a synchromesh gearbox with a long unwieldy gearlever was fitted. The SA had its biggest setback just ten days before the launch of the model was due, when a new sporting saloon was announced by SS Cars of Coventry. MG had never considered this company to be any threat to them in the past, as they were not producing cars to compete in the same market sector. SS also did not have any competition successes worthy of note, however, this new car, the first to bear the Jaguar name, was a far more serious rival. William Lyons, the owner of SS cars was a brilliant designer from the same mould as Kimber, he also made all the major decisions, which meant that the Jaguar SS went straight into production, unlike the floundering Nuffield group which took until early 1936 to decide on the specification and supply the parts for the SA. With the initial publicity long since forgotten, it was over 6 months since the introduction of the model before the MG Two Litre went into full production. This delay was due also to Abingdon trying to uprate the specification to improve its standing against the Jaguar. The car initially had a 2062 cc engine and this was increased to 2288 cc's to match the Jaguars 2663 cc unit. Normally this sort of alteration to the specification would have taken a matter of days when Abingdon were dealing direct with suppliers and were doing their own design work. It took months for the Morris engines division to change the specification as they saw it as a relatively unimportant job. As a direct result many disillusioned customers, over 500 in all, who had been waiting for their cars, changed their orders to the Jaguar s'S which was ready for immediate delivery. Other changes implemented were the replacement of the original bolt-on wheels with centre-lock wire wheels but even once production had started in earnest, there were continual changes in specification, which made a mockery of the so-called Nuffield efficiency. These changes could only be attributed to faulty initial design of the components; eventually even the complete chassis frame was modified. By the time of the 1936 Motor Show, circumstances dictated a price rise with the saloon now costing £389 and the Charlesworth open tourer at £385. The Tickford Coupe was introduced at £415. Early in 1937, the engine capacity was changed yet again to 2322 cc, probably to comply with Nuffield standardisation of models and there was little if any improvement in performance as a result. The performance could be described as adequate rather than exhilarating, with the car weighing in at almost a ton and a half and with only 75.3 bhp available, acceleration could only compare to its 18/80 forerunners. The SA did however have a genuine top speed of nearly 85 mph and could sustain a cruising speed all day long of 70 mph plus. Capacity: Early; 2288cc. Late; 2322cc Valve operation: Pushrod overhead valve. Gearbox: Manual 4 speed crash box on early cars. Part synchro on later cars. Chassis: Twin side members with cross members.